Seaborg was the principal or co-discoverer of ten elements: plutonium, americium, curium, berkelium, californium, einsteinium, fermium, mendelevium, nobelium and element 106, which, while he was still living, was named seaborgium in his honor. He also discovered more than 100 atomic isotopes and is credited with important contributions to the chemistry of plutonium, originally as part of the Manhattan Project where he developed the extraction process used to isolate the plutonium fuel for the second atomic bomb. Early in his career, he was a pioneer in nuclear medicine and discovered isotopes of elements with important applications in the diagnosis and treatment of diseases, most notably iodine-131, which is used in the treatment of thyroid disease. In addition to his theoretical work in the development of the actinide concept, which placed the actinide series beneath the lanthanide series on the periodic table, he postulated the existence of super-heavy elements in the transactinide and superactinide series. After sharing the 1951 Nobel Prize in Chemistry with Edwin McMillan, he received approximately 50 honorary doctorates and numerous other awards and honors. The list of things named after Seaborg ranges from his atomic element to an asteroid. He was a prolific author, penning numerous books and 500 journal articles, often in collaboration with others. He was once listed in the Guinness Book of World Records as the person with the longest entry in Who's Who in America. Glenn Theodore Seaborg was born in Ishpeming, Michigan, on April 19, 1912, the son of Herman Theodore (Ted) and Selma Olivia Erickson Seaborg. He had one sister, Jeanette, who was two years younger. His family spoke Swedish at home. When Glenn Seaborg was a boy, the family moved to Los Angeles County, California, settling in a subdivision called Home Gardens, later annexed to the City of South Gate, California. About this time he changed the spelling of his first name from 'Glen' to "Glenn". Seaborg graduated from Jordan in 1929 at the top of his class and received a bachelor of arts (AB) degree in chemistry at the University of California, Los Angeles, in 1933. He worked his way through school as a stevedore and a laboratory assistant at Firestone. Seaborg took his PhD in chemistry at the University of California, Berkeley, in 1937 with a doctoral thesis on the "Interaction of Fast Neutrons with Lead", in which he coined the term "nuclear spallation". Seaborg also became an expert in dealing with noted Berkeley physicist Robert Oppenheimer. Oppenheimer had a daunting reputation, and often answered a junior man's question before it had even been stated. Often the question answered was more profound than the one asked, but of little practical help. Seaborg learned to state his questions to Oppenheimer quickly and succinctly. Seaborg remained at the University of California, Berkeley, for post-doctoral research. He followed Frederick Soddy's work investigating isotopes and contributed to the discovery of more than 100 isotopes of elements. Using one of Lawrence's advanced cyclotrons, John Livingood, Fred Fairbrother, and Seaborg created a new isotope of iron, iron-59 (Fe-59) in 1937. Iron-59 was useful in the studies of the hemoglobin in human blood. In 1938, Livingood and Seaborg collaborated (as they did for five years) to create an important isotope of iodine, iodine-131 (I-131), which is still used to treat thyroid disease. (Many years later, it was credited with prolonging the life of Seaborg's mother.) As a result of these and other contributions, Seaborg is regarded as a pioneer in nuclear medicine and is one of its most prolific discoverers of isotopes. Seaborg served as chancellor at the University of California, Berkeley, from 1958 to 1961. His term coincided with a relaxation of McCarthy-era restrictions on students' freedom of expression that had begun under his predecessor, Clark Kerr. In October 1958, Seaborg announced that the University had relaxed its prior prohibitions on political activity on a trial basis, and the ban on communists speaking on campus was lifted. This paved the way for the Free Speech Movement of 1964-65. 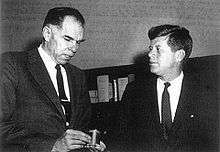 While chairman of the AEC, Seaborg participated on the negotiating team for the Limited Test Ban Treaty (LTBT), in which the US, UK, and USSR agreed to ban all above-ground test detonations of nuclear weapons. Seaborg considered his contributions to the achievement of the LTBT as one of his greatest accomplishments. Despite strict rules from the Soviets about photography at the signing ceremony, Seaborg snuck a tiny camera past the Soviet guards to take a close-up photograph of Soviet Premier Nikita Khrushchev as he signed the treaty. Following his service as Chairman of the Atomic Energy Commission, Seaborg returned to UC Berkeley where he was awarded the position of University Professor. At the time, there had been fewer University Professors at UC Berkeley than Nobel Prize winners. He also served as Chairman of the Lawrence Hall of Science where he became the principal investigator for Great Explorations in Math and Science (GEMS) working with director Jacqueline Barber. 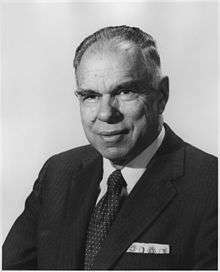 Seaborg served as at the University of California, Berkeley, from 1958 to 1961, and served as President of the American Association for the Advancement of Science in 1972 and as President of the American Chemical Society in 1976. During his lifetime, Seaborg is said to have been the author or co-author of numerous books and 500 scientific journal articles, many of them brief reports on fast-breaking discoveries in nuclear science while other subjects, most notably the actinide concept, represented major theoretical contributions in the history of science. He held more than 40 patents – among them the only patents ever issued for chemical elements, americium and curium, and received more than 50 doctorates and honorary degrees in his lifetime. At one time, he was listed in the Guinness Book of World Records as having the longest entry in Marquis Who's Who in America. In February 2005, he was posthumously inducted into the National Inventors Hall of Fame. His papers are in the Library of Congress. The American Chemical Society-Chicago Section honored him with the Willard Gibbs Award in 1966. The element seaborgium was named after Seaborg by Albert Ghiorso, E. Kenneth Hulet, and others, who also credited Seaborg as a co-discoverer. It was named while Seaborg was still alive, which proved controversial. He influenced the naming of so many elements that with the announcement of seaborgium, it was noted in Discover magazine's review of the year in science that he could receive a letter addressed in chemical elements: seaborgium, lawrencium (for the Lawrence Berkeley Laboratory where he worked), berkelium, californium, americium. Seaborgium is the first element ever to have been officially named after a living person, The second element to be named so is oganesson, in 2016 chosen for element 118, after Yuri Oganessian. Seaborg, G. T.; James, R.A.; Morgan, L.O. (January 1948). The New Element Americium (Atomic Number 95). US Atomic Energy Commission. OSTI 4435330. Seaborg, G. T.; Thompson, S.G.; Ghiorso, A. (April 1950). The New Element Berkelium (Atomic Number 97). UC Berkeley, Radiation Laboratory. OSTI 4421999. Seaborg, G. T.; Thompson, S.G.; Street, K. Jr.; Ghiroso, A. (June 1950). The New Element Californium (Atomic Number 98). UC Berkeley, Radiation Laboratory. OSTI 4424011. Seaborg, G. T. (December 1951). The Transuranium Elements – Present Status: Nobel Lecture. UC Berkeley, Radiation Laboratory. OSTI 4406579. Seaborg, G. T.; Thompson, S.G.; Harvey, B.G. ; Choppin, G.R. (July 1954). Chemical Properties of Elements 99 and 100 (Einsteinium and Fermium). UC Berkeley, Radiation Laboratory. OSTI 4405197. Seaborg, G. T., ed. (January 1980). Symposium Commemorating the 25th Anniversary of the Discovery of Mendelevium. Lawrence Berkeley National Laboratory. OSTI 6468225. Seaborg, G. T. (March 1995). My career as a radioisotope hunter. Journal of the American Medical Association. 273. pp. 961–964. doi:10.1001/jama.273.12.961. PMID 7884957. 1 2 Hoffman, D. C. (2007). "Glenn Theodore Seaborg. 19 April 1912 -- 25 February 1999". Biographical Memoirs of Fellows of the Royal Society. 53: 327. doi:10.1098/rsbm.2007.0021. JSTOR 20461382. 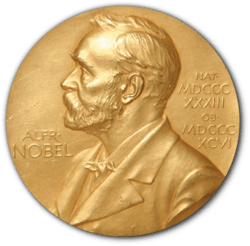 1 2 "The Nobel Prize in Chemistry 1951". Nobel Foundation. Retrieved August 26, 2012. ↑ "Past Chancellors | Office of the Chancellor". Chancellor.berkeley.edu. Retrieved 2015-12-24. 1 2 Hoffman 2007, p. 330. ↑ Hoffman 2007, p. 336. ↑ Seaborg & Seaborg 2001, pp. 13–14. ↑ Seaborg & Seaborg 2001, pp. 15, 29. ↑ Seaborg & Seaborg 2001, p. 40. 1 2 "Scientific and Luminary Biography - Glenn Seaborg". Argonne National Laboratory. Retrieved June 16, 2013. ↑ Lewis, G. N.; Seaborg, Glenn T. (July 1939). "Primary and secondary acids and bases". Journal of the American Chemical Society. 61 (7): 1886–1894. doi:10.1021/ja01876a068. ISSN 0002-7863. ↑ Lewis, G. N.; Seaborg, Glenn T. (July 1939). "Trinitrotriphenylmethide ion as a secondary and primary base.". Journal of the American Chemical Society. 61 (7): 1894–1900. doi:10.1021/ja01876a069. ISSN 0002-7863. ↑ Lewis, G. N.; Seaborg, Glenn T. (August 1940). "The acidity of aromatic nitro compounds toward amines. The effect of double chelation". Journal of the American Chemical Society. 62 (8): 2122–2124. doi:10.1021/ja01865a057. ISSN 0002-7863. ↑ Seaborg & Seaborg 2001, pp. 57–59. ↑ Seaborg & Seaborg 2001, p. 26. ↑ "National Award of Nuclear Science & History". National Museum of Nuclear Science & History. Retrieved 2012-08-26. ↑ "Seaborg Timeline: A Lifetime of Differences". Lawrence Berkeley National Laboratory. 5 March 1999. Retrieved 2012-08-26. ↑ Jackson, D. J.; Panofsky, W. K. H. (1996). Edwin Mattison McMillan (PDF). Biographical Memoirs. 69. National Academies Press. 1 2 Farmer, Delphine (2001). "An Elementary Problem". Berkeley Science Review. 1 (1): 32–37. ISSN 1538-6449. ↑ Seaborg & Seaborg 2001, pp. 77–79. ↑ Seaborg, Glenn T. "Nuclear Milestones: 307 Gilman Hall". Lawrence Berkeley Laboratory. Retrieved June 16, 2013. ↑ "Glenn Seaborg's Greatest Hits". Lawrence Berkeley National Laboratory. Retrieved 2012-08-26. ↑ Rhodes 1986, pp. 320, 340–43, 348, 354, 369, 377, 395. ↑ Hoffman 2007, pp. 333-334. 1 2 Seaborg & Seaborg 2001, pp. 174–179. ↑ House, P. (April 1999). "Glenn T. Seaborg: Citizen-Scholar". The Seaborg Center Bulletin. Retrieved May 23, 2011. ↑ Seaborg, G. T.; Colvig, R. (1994). Chancellor at Berkeley. University of California. ISBN 978-0-87772-343-1. 1 2 Yarris, Lynn (March 5, 1999). "Glenn Seaborg: A Sporting Life". Lawrence Berkeley National Laboratory. Retrieved June 17, 2013. ↑ "Glenn Seaborg Biography". Academy of Achievement. Retrieved June 17, 2013. ↑ "National Service". Lawrence Berkeley Laboratory. Retrieved July 23, 2013. ↑ "Space Sciences Laboratory". University of California, Berkeley. Retrieved June 16, 2013. ↑ Seaborg & Seaborg 2001, p. 181. ↑ "Meet Glenn Seaborg". Lawrence Berkeley National Laboratory. Retrieved 2012-08-26. ↑ Seaborg & Seaborg 2001, pp. 200-206. ↑ Seaborg & Seaborg 2001, pp. 218-221. ↑ Seaborg, G. T. (1969). "Prospects for further considerable extension of the periodic table". Journal of Chemical Education. 46 (10): 626. Bibcode:1969JChEd..46..626S. doi:10.1021/ed046p626. ↑ "Dr. Glenn T. Seaborg". Lawrence Livermore National Laboratory. March 30, 2006. Archived from the original on September 29, 2006. 1 2 "Meet Glenn Seaborg". Lawrence Berkeley Laboratory. Retrieved July 23, 2013. ↑ "Glenn Seaborg's Works". Lawrence Livermore National Laboratory. Retrieved 2012-08-26. ↑ "ACS President: Glenn T. Seaborg (1912-1999)". American Chemical Society. Retrieved June 16, 2013. ↑ Aleklett, K.; Morrissey, D.; Loveland, W.; McGaughey, P.; Seaborg, G. (1981). "Energy dependence of 209Bi fragmentation in relativistic nuclear collisions". Physical Review C. 23 (3): 1044. Bibcode:1981PhRvC..23.1044A. doi:10.1103/PhysRevC.23.1044. ↑ Matthews, Robert (December 2, 2001). "The Philosopher's Stone". The Daily Telegraph. Retrieved July 23, 2013. ↑ Yarris, L. (5 March 1999). 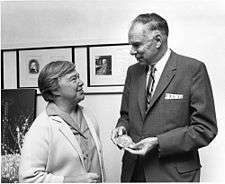 "Glenn Seaborg, Teacher and Educator". Lawrence Berkeley National Laboratory. Retrieved 2012-08-26. ↑ "A Nation at Risk' Turns 30: Where Did It Take Us?". National Education Association. April 25, 2013. ↑ Spellings, Margaret. "25 Years After A Nation at Risk". U.S. Department of Education. ↑ Seaborg & Seaborg 2001, pp. 193-194. ↑ Seaborg & Seaborg 2001, pp. 79-85. ↑ "Today at Berkeley Lab: Seaborg Family Remembers: Helen 'a Mixture of Efficiency and Diplomacy'". www2.lbl.gov. Retrieved 2016-12-02. ↑ Hoffman 2007, p. 332. ↑ "Glenn Seaborg Trail". Department of Energy. Retrieved June 16, 2013. ↑ Hoffman 2007, p. 335. ↑ Hoffman 2007, p. 337. ↑ Hoffman 2007, p. 334. ↑ "Glenn T. Seaborg No. 719 Vasa Order of America". Vasa Order of America. Retrieved June 16, 2013. ↑ Hoffman, D. C.; Ghiorso, A.; Seaborg, G. T. (2000). "The Transuranium People: The Inside Story". World Scientific Publishing: lxvii–lxviii. ISBN 1-86094-087-0. ↑ "Glenn Seaborg Tribute: A Man in Full". Lawrence Berkeley Laboratory. Retrieved June 16, 2013. 1 2 3 "Seaborgium: Element 106 Named in Honor of Glenn T. Seaborg, LBL's Associate Director At Large". LBL Research Review. August 1994. ISSN 0882-1305. Retrieved July 24, 2013. ↑ "Glenn Theodore Seaborg - A Register of His Papers in the Library of Congress" (PDF). Library of Congress. Retrieved June 16, 2013. ↑ Winters, J. (1 January 1998). "What's in a Name?". Discover. 19. Retrieved October 17, 2006. ↑ Ghiorso, Albert (2003). "Einsteinium and Fermium". Chemical and Engineering News. 81 (36): 174. doi:10.1021/cen-v081n036.p174. ↑ "IUPAC is naming the four new elements nihonium, moscovium, tennessine, and oganesson - IUPAC | International Union of Pure and Applied Chemistry". IUPAC | International Union of Pure and Applied Chemistry. 2016-06-08. Retrieved 2016-06-08.